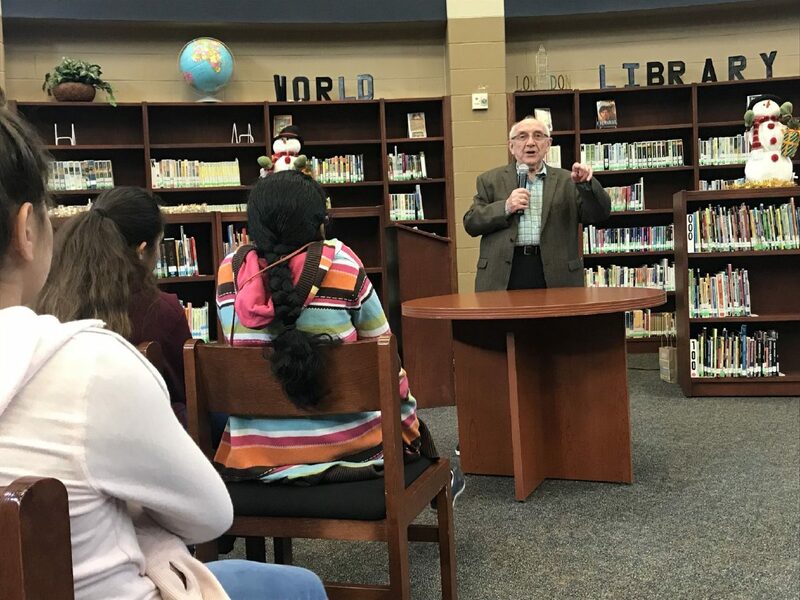 Fossum Middle School students listen as Holocaust survivor Max Glauben delivers a message to them on Monday. McALLEN — Hundreds of Rio Grande Valley students heard a special message of resilience Monday coming from Holocaust survivor Max Glauben. Earlier in the day Glauben, 89, visited with middle schoolers in Mercedes. During his talk, he shared part of his testimony of being the only one in his family to survive five years in the Warsaw Ghetto, the Budzin labor camp, and later the death march cut short by United States rescue efforts. For many of these students who were prompted by teachers and librarians to write letters to Glauben about their perception of the holocaust and his story, this is one of the few times that their history pages will materialize into a personal story. And Glauben said this was one of the main reasons he continues to tour and recount his story, even if it comes with many painful details such as the death of his mother, father, younger brother and many others who he saw drop to the ground out of hunger, exhaustion and illness. “Only through education can we conquer freedom and also eradicate hatred, bigotry and bullying,” he said about the reason to tour the country. Considering his audience, the message targeted bullying as an example of the harm that can be done not only by the aggressors, but also on those who failed to act against the atrocities done to millions of Jews during World War II on the hands of Nazi Germans who spread hate and the belief of racial superiority. Some of these people lost to hate, he said, were talented doctors, inventors, artists and people who could have tackled some of the illnesses or fixed now-pressing issues. So students have to realize, he said, that just like people choose to do good, there are also those who choose to do evil and that’s when he hopes they take a stance to shelter and stand by those who are being affected, even if they are not being the ones targeted. This is a message he said is especially important to spread today as he sees the history of racially hateful messages and division quickly spreading throughout the United States. But when looking around at the students who were going about their school day rushing from class to class, Glauben said he was hopeful that this generation will be better suited to lead the country and the world if given the right message.